How to Prevent Excess Gas Accumulating in Your Ostomy Pouch? The key to living with your ostomy and maintaining your quality of life is making sure you use the correct equipment and accessories that fit you. There is no one-size-fits-all when it comes to ostomy appliances. Each patient is different and so is each surgery. That’s why ostomy pouches offer many different openings to accommodate differently sized stomas. Your ostomy/stomal nurse will be able to assist you in determining how to measure your stoma opening so that you may use the appropriate pouching system. The correct measuring of your stoma is crucial in selecting the proper pouch system. A properly fitted pouch will minimize stomal and skin irritation and maximize your pouch wear time. 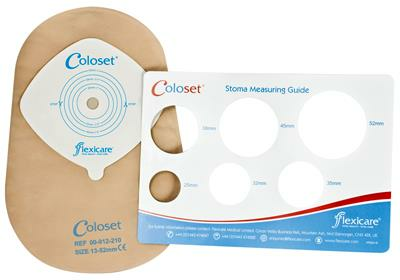 Some manufacturers, such as Hollister, offer a stoma measuring card to their patients and your nurse will be able to show you how to properly use this measuring device. If you use a skin barrier that is too large for your stoma, you can leave skin susceptible to irritation or even erosion. Avoiding skin irritation can minimize complications in the future and maintain your quality of life. How do I Properly Measure my Stoma? Using your measuring device, you will be able to determine the diameter of your stoma opening. Once you have measured properly, you will need to select a skin barrier that can fit comfortably around your stoma without touching it. This will limit the amount of skin exposed and keep skin irritation to a minimum. Some pouch kits require you to cut the opening to the proper diameter. While this can be done with scissors, the Nu-Hope Hole Cutter Tool can cut consistently and accurately. It comes in a variety of sizes from ½ inch to 2 inches. See below diagram for proper measuring technique. Will my Stoma Size Change? Initially, after surgery, your stoma will be swollen and therefore larger. Over approximately the next six weeks you should measure the size of your stoma as the swelling subsides. Regular measuring is important so that you use the appropriate size pouching system. According to the Canadian Society of Intestinal Research, the opening of a traditional flange/alliance should be 1/8 of an inch larger than the base of your stoma. Changes to establish stoma can also occur, mainly due to weight gain. This weight gain can also affect the skin around the stoma, therefore making your pouching system no longer appropriate. With women who are pregnant and have a stoma, it is recommended to have regular evaluations of your stoma and pouching system throughout your pregnancy. As the website badgut.org points out, weight gain during pregnancy (especially the second and third trimesters) can cause the stoma to become flush or even retracted during the latter stages. Other causes for change in your stoma are a prolapse (lengthening) or even a hernia (peristomal hernia) which causes a bulging of the skin and can affect the sealing ability of your pouching system. Also, aging can affect the shape and size of your stoma. As we get older our muscle and skin lose strength and tone, possibly changing your stoma and the skin around it. When this happens changes might need to be made to your pouching system. A good idea is to see your doctor/nurse every year for an evaluation of your stoma and pouching system. Disclaimer: All content found on our website, including images, videos, infographics and text were created solely for informational purposes. Our content should never be used for the purpose of diagnosis or treatment of any medical conditions. Content shared on our websites is not meant to be used as a substitute for advice from a certified medical professional. Reliance on the information provided on our website as a basis for patient treatment is solely at your own risk. We urge all our customers to always consult a physician or a certified medical professional before trying or using a new medical product.